Selling and purchasing of goods are one of the most important processes that take place in almost every business. If one company wants to purchase the goods, it has to contact the seller of the goods. When the seller of the goods is willing to sell his goods, an agreement is created between the buyer and the seller. According to the agreement between the buyer and seller, the buyer is responsible to pay the seller on time and the seller is responsible for timely delivery of sold goods. All the reputed buying and selling companies follow all the terms of the contract flawlessly. What is notice to reclaim goods? There comes a situation sometimes when the supplier wants the delivered products back. There can be many reasons that can cause the seller to reclaim the goods. If the supplier wants to get all the delivered goods shipped back to him, he should adopt a professional way of reclaiming the goods. Sending the notice to reclaim goods is the most professional way to reclaim. If the manufacturer informs the supplier about the defects in the products, the seller may want to get the sold goods back just because he does not want to ruin his reputation. He may want to send those goods back to the manufacturer for replacement or repair. This notice can be very helpful for the supplier in requesting the buyer to send the goods back to him. Another reason for reclaiming the goods is that the buyer has not paid the supplier and the supplier sends him a notice to reclaim the goods or pay the money. The notice can also state that If the buyer will not send the products back, the sender will have to take serious actions against him. Since this notice is a professional document, the formal should be used while writing this notice. Use the polite language in the notice so that a good business relationship with the buyer can be maintained. Add all the necessary details in the notice. Make sure that the notice has been written in an easy to understand text that can be easily understood. 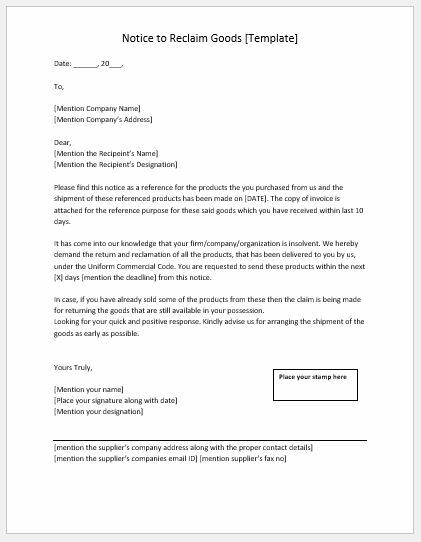 Please find this notice as a reference for the products you purchased from us and the shipment of these referenced products has been made on [DATE]. The copy of the invoice is attached for the reference purpose for these said goods which you have received within last 10 days. It has come to our knowledge that your firm/company/organization is insolvent. We hereby demand the return and reclamation of all the products, that has been delivered to you by us, under the Uniform Commercial Code. You are requested to send these products within the next [X] days [mention the deadline] from this notice. In case, if you have already sold some of the products from these then the claim is being made for returning the goods that are still available in your possession. Looking for your quick and positive response. Kindly advise us for arranging the shipment of the goods as early as possible.